Wash beets thoroughly and cut off greens if necessary. 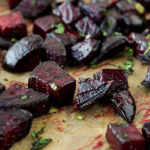 Cut the beets into 1 to 2 inch cubes. Transfer to the baking sheet and toss with the olive oil and salt. Roast for 20 minutes, then remove from the oven and stir. Roast for an additional 15-20 minutes. Remove from the oven and let cool for a few minutes. Add the fresh parsley, stir, and serve.